Kipp d´Amundsen Siberian Husky Kennels were established in 1993, and we had 4 siberian huskies then. Between years 1991-1999 we raced in mainly sprint and mid distance races all over central Europe, with the longest (stage) races called Gold Nugget - 120km (1995, 1996) and Sedivackuv Long - 200km (1998, 1999). Since the very beginning, the kennel owner and main musher Katerina was charmed by the elegance and beauty of this breed, but aware at the same time of it´s original working purpose. Therefore the goal of breeding dogs, carefully selected from the original, outstanding, proven working lines, with high quality arcitc coats and the charming, for this breed so typical expression and temperament became the kennel´s breeding philosophy. We competed in sprints and mid distance, but deep inside it was becomming more obvious every year, that we want to challenge the arctic elements and see our dogs doing what they were originally bred for in their homeland - Siberian Chukotka, and what their breed standard describes them as: "moderately built dog, capable of pulling relatively heavy loads with a moderate speed over long distances". The philosophy of the early years never changed. Instead, it became our clear target for all our present and future activities. In the fall of 2005 we moved to northern part of Sweden, where we, surrounded by 140km long lake Vattudalen and hilly, forest landscape, offering hundreds of miles of training tracks, finally live our dream of LONG DISTANCE mushing. During the years, we have noticed the deepening gap between two, today more and more extreme, types of siberian (the so called "show" and "sprint-racing" types), which evoluted from the original, often reffered to as multipurpose or classic, type of the siberian husky. While we strongly believe in the working purpose of the breed, with the most suitable length, serving the breed´s original purpose, being the mid and long distances, we at the same time strongly support the idea of the original appereance of siberian husky. For that reason we also show our dogs at club, specialty, national and international shows. We do not have two different lines of dogs - one for shows and one for races! An ideal dog in our eyes (and the one we select for our breeding program) is an individual with as standard built, appreance and expression, temperament, performance and intelligence, as possible. Together with genetic health, proven by eye and hip testing. Since we had a break in racing for 4 and in breeding for 5 straight years, we are presently focussing on building up a team for mid and long distance competitions, and raising around 2 litters each year, to add some future help to the team. We train 3 teams year round (weather permitting) being - the main string team, the yearling team and the puppy/senior team. The puppies/seniors are driven mostly by Jachym, the main string by Katerina and the yearlings by both. 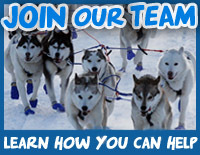 To meet our current athletes and trainees, please visit their special page. Our goal is to compete in mid and long distance races in Scandinavia, such as POLARDISTANS 160 and 300km, Femundlopet 400, Finnmarkslopet 500, Femundlopet 600 and Finnmarkslopet 1000. We realize these goals are high. That´s why we moved to Scandinavia, to a place with the best possible conditions for preparing for such events. That´s why we breed the type of siberian husky, that is originally known and proven successful on this type of events. And that´s why we also need support from friends and those that believe in our dogs, us and the whole Kipp d´Amundsen Siberian Husky Kennels and Team PHILOSOPHY. If you believe in this philosophy, in our furry kids - the real stars and athletes of our team, an in us, and would like to support us on our journey to reaching the goals, please go to our SPONSOR page for more information, how you can help and become a part of our team.